Pikachu is so cute that you might just want to snuggle up with the Pocket Monster and go to sleep. Well, now you can. 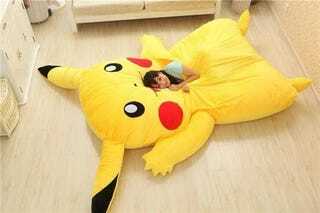 Available via Mercari, this is the Pikachu Bed. It weighs 15 kilograms (33 pounds) and has a washable cover. Oh, and it looks like everyone's favorite electric rodent. While this might not be an official Pokémon product, it looks large enough to sleep one adult. The Pikachu Bed is priced at 39,800 yen (US$371) and would make a wonderful sleeper set with the Snorlax snoozer.